Opposition Senator Evaliere Beauplan fell under the loop of journalist of radio Caraibes FM for having told protesters to dump oil in the streets of Haiti as a form of roadblock. After the journalist re-broadcasted what Senator Beauplan said, comments were made where the journalists showed their disagreement with what the senator said. former Senator doctor Fransisco Delacruz commented that someone needs to do a psychological analysis of Senator Beauplan to see if he hasn't lost it. Minutes later, Senator Beauplan called the radio station and he lost it, accusing the journalists of being paid to discredit him. 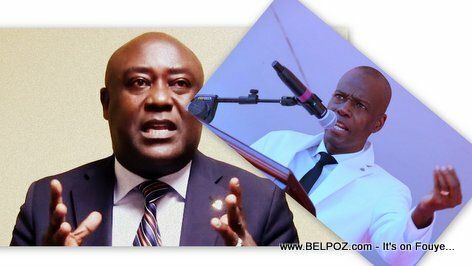 Senator Beauplan told journalist Roberde Celine (Bob C.) and Guerrier Dieuseul he was just telling the people what to do to prevent bandits from entering their neighborhoods while, in the audio that was played, he was saying he tried to hard to force President Jovenel out of office and he will not go to the negotiation table; he will fight until the end. We hope to find the audio online so you can hear everything that happened early Friday morning, November 23 2018 on radio Caraibes' morning new program Premye Okasyon.